Left to right: Col. Jason Schott, 412th Test Wing vice commander, presents the Airman Leadership School John L. Levitow Award to Senior Airman Donald Badgett, 31st Test and Evaluation Squadron, along with Chief Master Sgt. Todd Simmons, 412th TW command chief. The Levitow award is presented to the student that demonstrated the most outstanding leadership and scholastic qualities. 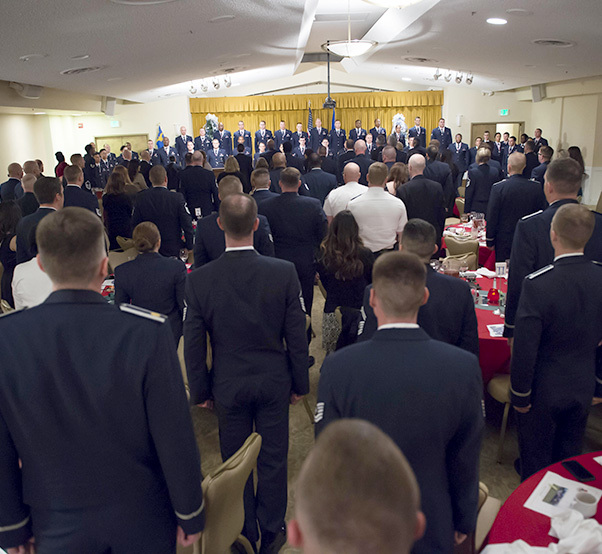 The 412th Force Support Squadron’s Airman Leadership School at Edwards Air Force Base, Calif., ended 2016 on a high note by graduating 44 senior airmen and one civilian Dec. 8. 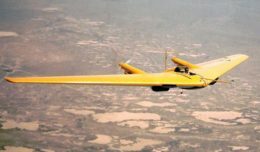 According to 412th Test Wing leadership and ALS staff, the newest crop of graduates is one for the record books. The Air Force Total Force program also allows civilian Airmen to attend ALS. In February, two civilians from Edwards were the first to graduate from ALS in Air Force Materiel Command. Air Guard and Air Reserve Airmen are nominated through their respective commands and assigned ALS slots where available, including at Edwards, which Magas said is very accommodating to higher-headquarter needs. “I personally feel it’s the best thing we could have ever done within the EPME community. Regardless of our Air Force component, we serve as Airmen and should be trained in the same regard,” Magas said. ALS is a five-week United States Air Force program designed to develop Airmen into effective front-line supervisors. It is the first professional military education that enlisted Air Force members encounter. ALS focuses on building leadership and team development abilities as well as effective communication. Wing leadership says they would also like to expand ALS in the future by inviting sister service and foreign military members on base to attend. 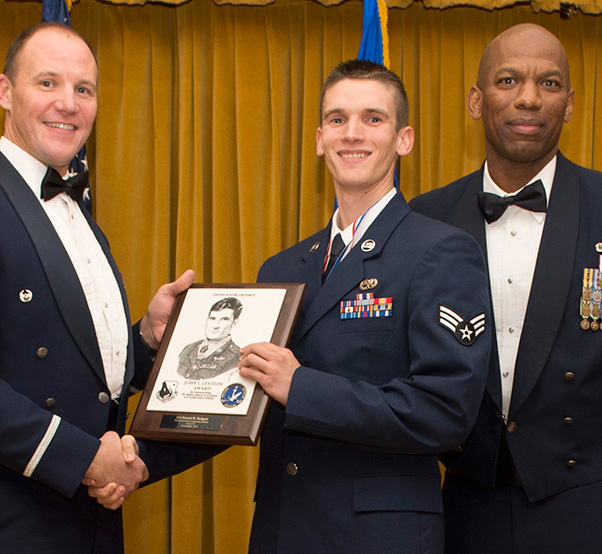 Donald Badgett, 31st Test and Evaluation Squadron, was the John L. Levitow Award Winner. The 412th Force Support Squadron’s Airman Leadership School Class 17A graduated 44 senior airmen and one civilian Dec. 8, 2016, at Club Muroc. Sean Smith, 412th Aircraft Maintenance Squadron, and Jesse Chavez, 412th Aircraft Maintenance Squadron, were Distinguished Graduates. The Distinguished Graduate Award is presented to the next (10 percent of graduates) person with the highest overall average in all graded areas, and demonstrated a high level of leadership skills. Douglas Gore, 412th Maintenance Squadron, received the Commandant’s Award, which is presented to the student who has displayed all the characteristics of an effective leader, but is not based at all on academic standings. And Matthew Watters, 412th Aircraft Maintenance Squadron, was named the Academic Achiever Award recipient. The award is presented to the student with highest overall average on all academic evaluations.